Do Marvel Fans Hate Women and Diversity? Not Hardly. This is news Marvel apparently got from the retailers selling its comics. While some retailers saw an influx of new clientele, most saw a big drop as people ignored the new comics because their favorite characters – Captain America, Iron Man, Falcon, Hulk, Thor, etc. – were being killed off and/or humiliated, which means that their audience felt depressed and/or mortified. Marvel’s comic book sales have weakened in proportion to the steady stream of replacement, politically correct characters and stories the company has been trying to shove down our throats for the past three or four years. I was astounded to see this statement from Mr. Gabriel. I have known for years that Marvel would lose revenue if it abused its audience by maltreating or destroying its characters. If you have followed my blog for a while, you know this is so. What surprised me was that a member of Marvel’s hierarchy actually admitted that sales were dropping because of the “new materiel” they were introducing. I told ‘em this was going to happen, but did they listen to me? ‘Course not. And now they are shocked that people do not want to buy comics that make fools of and/or destroy their favorite characters. Well surprise, surprise, surprise, Marvel! How could you have missed that fastball? I can hear some of you fainting right now. You think I am an awful person for celebrating this news, no? That I hate women and diversity, too, n’est pas? Well, no, I don’t. Allow me to explain what made me rejoice over Mr. Gabriel’s statement: what made me happy about his announcement was that he has finally admitted, on behalf of the company he serves, that politically correct characters are turning fans off of the Marvel franchise. He has finally acknowledged the obvious; that so-called “characters” like Jane Foster/Thorette, Amadeus Cho/New Hulk, Riri Williams/Ironheart, Kamala Khan/Ms. Marvel, and Gwen Stacey/Spider-Girl, along with other “new,” “diverse,” and “legacy” protagonists – which are supposedly “meant to bring women and minorities to the forefront of social consciousness” – are really hurting instead of helping Marvel’s brand. So if I like what Mr. Gabriel had to say, then why am I writing this post? I am writing this post because he and his colleagues are missing the point of why their sales are falling. Mr. Gabriel says what they believe; that legions of Marvel’s fans hate women and diversity, and so they need to keep doing what they are doing in order to win their “deplorable” fans – you and me – over to their view of the world. In essence, they are accusing the thousands of people who support their business of widespread bigotry, intolerance, and stupidity; completely ignoring the beam in their own eye to pluck out the mote in ours. This is what has Marvel fans so upset. This is why they have stopped buying the new comics. Marvel fans definitely do not hate diversity or women. The latter is proved by the fact that Marvel already has hundreds of established female characters with existing fanbases – although you would not know that if you were new to the Marvel multi-verse or have only heard about it from the mouths of twits (most comic book film critics). Go to my post “Offended, Insulted, and Not Shutting Up” for a roll of Marvel’s female characters and a link to a longer list where you can learn about more of them. The fact is that these reviewers could care less that Marvel has a panoply of female characters for the simple reason that it is not part of their agenda. As for the idea that Marvel fans hate diversity, this is a laughable argument because it is so easily invalidated. Marvel has been diverse since it was founded, something that is shown through characters like Storm, Falcon, Black Panther, Misty Knight, and Luke Cage, all of whom are black. Separate sources have consistently claimed that either Black Panther or Falcon was the first black superhero to appear in comics, beating out DC’s Black Lighting. I think that Storm might predate the three of them, but I am not sure. Quicksilver and the Scarlet Witch are Gypsies, readers. Red Wolf, Mirage, and Thunderbird are American Indians; and Colossus and the Black Widow are Russians who have become U.S. citizens. Then there is Nightcrawler, who is German and who barely resembles a human; Silverclaw, who is Brazilian; Sunfire, a Japanese man who follows the tradition of the samurai, and Bengal, a Vietnamese superhero who lives and works in Vietnam. If Marvel were not diverse, readers, then these characters would never have been created by Stan Lee and the original writers. If Marvel’s fans hated diversity, none of these characters would have lasted more than one issue. Before 2015, they were all alive in the Marvel multi-verse, which means they have, collectively, been around for nearly seventy years. How can people who have kept these characters “alive” for so long hate diversity? Answer: they cannot, and therefore they do not, hate diversity. So if Marvelites do not hate women or diversity, then why is Marvel losing revenue on its new comic books? Hmmmm…. Maybe these books are doing poorly because the fans, new and old, actually like Thor Odinson as the Prince of Thunder and not some prancing female using his hammer and claiming to be something she is manifestly not. Maybe fans truly liked Bruce Banner as The Incredible Hulk and really hate the fact that Marvel had one of his best friends kill him. Maybe fans are in fact more than a little bit upset by Marvel’s decision to make Steve Rogers a secret agent of HYDRA and a flaming NAZI. Maybe they genuinely like Tony Stark as the Invincible Armored Iron Man who can build his way out of a trap with a broken laptop and some chewing gum, instead of a fifteen year old science whizz-kid who could do her own thing instead of shoehorning herself into his act. And maybe they do not like one of the first black superheroes – Falcon – being shoved into the role of Captain America, since it smacks of condescension and patronization. This move by Marvel is obviously meant to appease the PC police. And by doing this to the Falcon, Marvel’s writers are essentially stating that they think Sam Wilson – and therefore his fans – should not be satisfied that he is one of the first two black superheroes in comicdom. They would rather destroy the Falcon to make a new, “modern” Captain America that is anything BUT an American. So maybe the reason sales are dropping is because fans think that pushing Falcon into Steve’s suit, handing him Rogers’ shield, and leaving him to spout anti-American claptrap like a ventriloquist’s dummy actually demeans African-Americans instead of “elevating” them or making Sam “more relevant” to the times. Yeah, I think these facts may have more to do with your declining sales than sexism or racism, Mr. Gabriel. Too bad you and everyone else at Marvel have not realized this yet. Or, realizing it, you have decided that you know what we want because you are the “better and the brighter” of society and YOU are never wrong. We are just peons who cannot see the mote in our eye. That might be true, but you are missing the enormous beam in your own eye, buster. So much for the customer is always right, eh, readers? 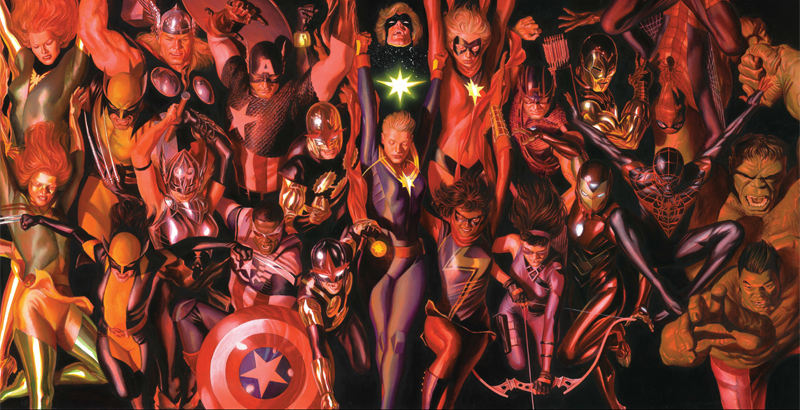 The reason I am writing all of this is because the people presently helming Marvel – and their enablers/cheerleaders in the world of critics – do not want more diversity or female characters. They want an emasculated male populace and homogeneity. They want black to be white, left to be right, and the population of the world to be nothing less than mental clones of them. Though they are doomed to failure, this does not mean that we can simply sit on the sidelines and let them ruin the Marvel universe(s). It means that we have to fight back against their dehumanizing push for sameness. Just think about it, readers. After House of M the Marvel universe – which was originally upbeat, positive, and generally told decent to good stories – took a nosedive into the muck. After House of M we were fed the atrociously immoral and disgusting “Ultimate Universe.” Then we were handed the insipid “New Avengers” storyline and endured the advent of the largely lukewarm “Young Avengers” crew. We were handed the demoralizing Civil War arc next. Then we had the sickening Avengers vs. X-Men event; the asinine “Unity Squad” story line, and the Original Sin plotline which led to the putrid rewrite of the Marvel universe(s) in the Secret Wars event of 2015. She says this makes it hard for new readers to focus, and I will not argue that these endless events do not help new fans to get their footing in the Marvel multi-verse – or, rather, what is left of it. But the problem she does not address is that none of these events or crossovers is positive. These stories are all negative and thus display brazenly the idea that Marvel’s management, who believe themselves the “best and the brightest” (but are truly the dumb and the dimmest), know what’s best for the rest of us. They also continue to drive the homogeneity mantra onto readers’ minds like a suffocating pillow. Not one of these events leaves a reader feeling uplifted and ready to face the world again. How do I know this? Because that is what simply reading descriptions of these story arcs did and still does to me. And I am not alone, something which Mr. Gabriel’s admission about moribund comic book sales proves. Every last one of the story arcs I listed above may be compelling and addictive to some readers, but to most of us they reek of negativity, despair, and nihilism. How many people want to stew in an emotional/mental/spiritual refuse pile like this? If the downturn in Marvel’s comic book sales is as steep as Mr. Gabriel seems to believe it is, then I think I am safe in saying that ninety percent of normal, everyday people do not want this junk. This means that Marvel is selling to a narrow market which is shrinking day by day. Again, I will not argue with her. Though I have no idea what Marvel pays its artists and writers, I do know that the writers they are allowing free reign in their universe(s) at the moment should not be allowed anywhere near a keyboard or a pen. The “stories” that many of these writers are pumping out are evidence that they are intellectual hamsters running inside fetishified exercise wheels decorated with death’s heads. So finding new writers for Marvel who have positive attitudes and a love of truth, beauty, and goodness is going to be a challenge. Believing that Marvel would hire these people seems to be asking for a miracle. And if Marvel currently has writers who want to tell true, good, and beautiful stories with their characters, these writers appear to be few and far between. And these people are either barely hanging on to their jobs or they have left for greener pastures. Good question. There are several options available to fans, readers. If you are like me and my friends, and you do not like the stories which Marvel is publishing, keep doing what you have been doing: avoid their new comics like the plague. This means that their sales will keep plummeting and they will, sooner or later, be forced to clean up their act in order to stay in business. Or they will finally hire people who will do this service for us. Either way, remember that money talks. If your money is not going into their pockets, then the silence will get their attention. Another option is to become a writer yourself. If you write good stories and books and they sell well, are positively reviewed, and have the masses talking with mouths and wallets, then Marvel will probably notice you. Then maybe – just maybe – you will get lucky and they will tap you to write for them. If you do manage to accomplish this feat, then I would add the caveat that you do your best to keep your eye on the prize. Put your slippers under your bed, as Denzel Washington advised, so that you always have to kneel down to get them in the morning. You got where you are by telling good, true, and beautiful stories, and this is what you want to do with Marvel’s heroes. Keep that goal in mind and you should be fine. If you are not much of a storyteller, and you are already speaking by not buying Marvel’s comics, then you can always write letters to Marvel in order to explain your displeasure with them. This is what I do; I watch Marvel’s movies, read the older comics, and critique the cartoons. Besides blogging about the characters I enjoy as much as I can, I also write letters to Marvel’s top echelons, telling them what I think of their new comics (and I don’t think much of them). You can do this, too, readers. Marvel has five different email addresses where you can send letters, as well as a section for general feedback on their website. I have never gone that route, so I cannot tell you what to expect if you try it. However, if you write letters to Marvel, put OKAY TO PRINT alongside your email’s subject heading and send it to one or all of the following addresses: onlinesupport@marvel.com, spideyoffice@marvel.com, officex@marvel.com, mheroes@marvel.com, and/or mondomarvel@marvel.com. And do not be threatening when you write to them. Believe me; they will notice your letters, even if they are politely phrased. The squeaky wheel gets the grease, and we Marvel fans have more right to be squeaky than that posse of small-minded critics and “cultural gatekeepers” do. Unless these people actually buy Marvel’s comics in droves (which they very obviously do not), they are not the audience the company has to please. It was our money that made Marvel what it is today, not the critics’ pens. I say it is high time we reminded Marvel of this fact. For myself, I will continue to do all of the above. I know I sound as though I am crusading against Marvel’s hierarchy, and I guess I am, after a fashion. But I am doing so as a customer who desperately wants to preserve an enjoyed and admired product, so that I can pass it on to others to enjoy in the future. I want to be entertained by Marvel for many more years, readers. Right now, they are not entertaining me OR legions of their fans. They are trying to force their view of the world on us through these “new,” PC characters, destroying the good and great and true ones in the process. That is cultural bullying, which is a form of intellectual tyranny. It must be stopped. The only way that we can convince Marvel’s management to right the ship is to tell them why we are not buying their product. But we have to actually tell them if we are to have any hope of returning Marvel Comics to the good, the great, and the true, which is timeless. This entry was posted in Essay, Marvel Comics' Characters and Stories and tagged "mainstream" Marvel Universe, #nohydracap, All-New All-Different Marvel Comics, Amadeus Cho, Avengers, Bengal, Beth Elderkin, Black Panther/King T'Challa, Black Widow/Natasha Romanoff, Captain America Nazi, Captain America/Sam Wilson, Captain America/Steve Rogers, comic books, David Gabriel, Death, declining sales, Denzel Washington, Disassembled, diversity, diversity in Marvel Comics, Essay, Falcon/Sam Wilson, female superheroes, first black superhero, Gwen Stacey/Spider-Girl, House of M, hulk, HYDRA, Ironheart/Riri Williams, Jane Foster, Jane Foster/Thor, Kamala Khan, letters, Luke Cage, Marvel, Marvel Comics, Marvel Comics' Characters and Stories, Marvel fans, Marvel Female Superheroes, Marvel Generations, Marvel's 2015 Secret Wars, Marvel's hierarchy, Mirage/Danielle Moonstar, Misty Knight, Ms. Marvel, Nightcrawler/Kurt Wagner, politically correct, Quicksilver/Pietro Maximoff, Red Wolf, sales, Scarlet Witch, Scarlet Witch/Wanda Maximoff, Silverclaw/Maria Santiago, Stan Lee, Strong Women, Sunfire, superheroes, The Scarlet Witch, Thor Odinson, Thorette, Thunderbird, Ultimate Marvel Comics, Vietnam, women, women in Marvel Comics, writing, Young Avengers on June 27, 2017 by The Mithril Guardian. Last year I did a post called “Avengers Assemble Season Three – How Is It So Far?” That post covered the first eight episodes of the third season. Reading it, you will find that I was most pleased with what I had seen at the time. Now that the “Ultron Revolution” has run its course and “Secret Wars” – hopefully no relation to the lousy 2015 comic book event – are in our viewing future, you might be asking yourselves: what did I think of the rest of season three? Since I wrote individual posts on the episodes “Inhumans Among Us” and “Captain Marvel,” these stories will not be discussed at length herein. If you wish to know what this writer thought of those episodes, use the search engine to find the posts about “Inhumans Among Us” and “Captain Marvel,” readers. “The Inhuman Condition” was much better than its predecessor, “Inhumans Among Us,” in my book. There was no angst, no fuss, no muss, just cooperation between the Avengers and Black Bolt. Lockjaw giving Cap a few licks was good, too, since it showed that even a dog can recognize how great Steve is. It was wonderful to watch Hawkeye being his usual confident self instead of a doofus. It was also nice to hear Tony actually ask for help for a change, and watching Thor smash Ultron is always fun. Ah, I love the sound of Mjolnir hitting maniacal robots in the morning, don’t you? Now “The Kids Are Alright” I had some problems with, and there are friends of mine who have issues with it as well. One, for instance, hated that Khan interrupted Cap when he gave the kids a tour of the Tower. Another friend considers Khan to be nothing more than an annoyance during the episode’s run, since she has no purpose in the narrative of the show. She did not demonstrate any depth of character, either; she is just a fangirl who got lucky and ended up with superpowers. What is this author’s opinion? I am no fan of Kamala Khan/Ms. Marvel. To me, she is no more entertaining than her namesake. Also, Khan was not allowed by the writers to make any mistakes in combat during this show. She and Inferno had been using their powers for all of, what, a week? And yet she is a better fighter than he is? I am sorry but no, no, no, and no. Rookies do not do that well on the job in their first weeks; it does not happen unless they are extremely talented and/or lucky. Luck I will admit Khan has, but as for talent, it does not take much to imitate Mr. Fantastic – who should at least be mentioned in this series, by the way! I thought that Inferno got short shrift here, too, being portrayed as the cocky kid who runs into a situation without thinking. I can handle a callow youth or a hothead, but the fact is that these often unwelcome traits do not necessarily add up to stupidity, which is the direction the Marvel writers appeared to be heading with the character in “The Kids Are All Right.” Inferno can do much better, but it does not seem that the writers want him to do better. They ought to bring Dante into “Secret Wars” as part of the Earth-bound Avengers just to give him a better showing than the one he got in season three. 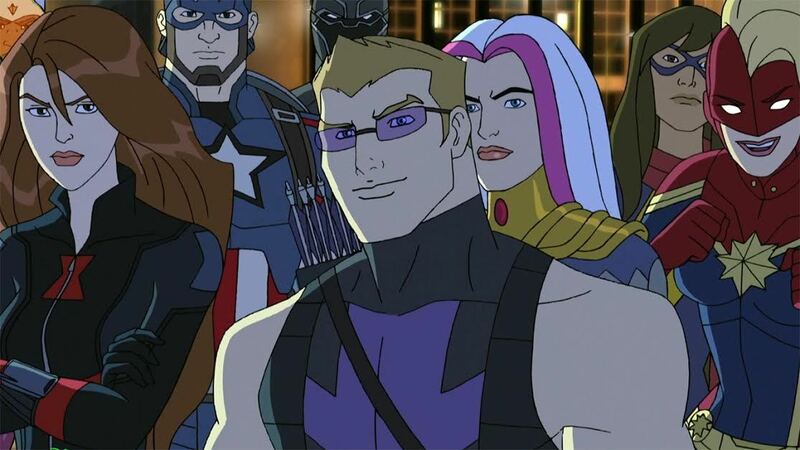 On the bright side, Cap and Hawkeye did well in this show. Cap was his usual charming and encouraging self while Hawkeye got to prove (again) that although he may not be a super genius, this does not mean he is stupid. The sad thing is that they are the only saving graces in an otherwise politically correct, namby-pamby, wishy-washy, feel-good episode. You can tell I was not “feeling the love” from this show, can’t you, readers? But the fact remains that some of the guys in Thor’s rebellion should have been allowed to say at least one word. Having Thor as their leader and letting him give the speeches was good; along with the rebellion twist, it made a lot of sense. He is Asgardian and immortal – practically speaking, anyway. Of course he would live into the thirtieth century, where he would start a rebellion against Kang’s tyranny, and of course he would end up bald as Odin. But at least ONE of the male rebels in Thor’s band should have been allowed to talk instead of being used as scenery filler. This is a minor quibble with an otherwise excellent episode, but it is an important one to make. Marvel is trying to feminize its franchise, from Iron Man to Thor to Hawkeye and beyond. I am tired of it. The company already has great female leads; they do not need a bunch of milksop fems strutting across the screen, attempting to be something they are not. If they want to add new characters to help tell new stories, that is fine. But trying to replace the originals with newbies like Khan does not work; to the best of my knowledge, it never has. And when they try to make all their heroes female, the writers make matters worse. Remember, I like Steve Rogers, Clint Barton, Tony Stark, Thor Odinson, Bruce Banner, Bucky Barnes, Sam Wilson, Vision, Quicksilver, and many of the other male leads in Marvel because they are male. And I am not the only one. I wish that Marvel would get this fact through its thick, corporate head already and let me save my breath on this issue. Now we will go back to business. In “Seeing Double” we watch as Natasha faces off against Black Widow wannabe Yelena Belova. I have read about the character but never seen her, and this episode is a very impressive introduction for her. It fleshed out Natasha’s character in the bargain, and the hint that maybe she did not throw away the thumb drive said to contain her real memories was an unexpected twist. Making the Hulk into a large, green version of the Winter Soldier was something that I did not see coming. My only disappointment is that we never got to see Bucky here or during season three. Then we have “A Friend in Need,” where Vision is introduced to the team. It was a nice installment, from Thor’s taking him to Asgard and teaching him about friendship to Vision’s nearly permanent sacrifice to save his friends. The three-way training session with Cap, Widow, and Hawkeye was a good bonus point, as was Vision playing video games with Hulk and Thor at the end. Very cute scene! After this we had “Panther’s Rage,” an episode that presented T’Challa/Black Panther, Wakanda, and the Dora Milaje in an interesting way. Hawkeye’s flirting with Aneka was somewhat irritating, but their resultant friendship had a much better vibe to it. Cap and Thor’s ability to understand Panther and their subsequent friendships with him were believable and fun as well. And watching the pack of them kick Klaue’s fanny was great, as usual. But I am kind of getting tired of T’Challa always showing up on the Avengers’ doorstep angry. How about a little variety next time, Marvel writers? “Ant-Man Makes It Big” was a fun episode in which Marvel proved that, despite many changes over the years, they still like to poke fun at themselves from time to time. Thor teaching a snobby actor the reality of life was a plus, as was Hawkeye’s easy acceptance of Scott and his new job. Having Widow angry at Scott for leaving the Avengers was an interesting and compelling development. It is nice to see that they have completely separated her from their original Amazonian stereotype and allowed her to be the character she always has been. There was one thing about “House of Zemo,” however, that felt off to me: Helmut Zemo’s “redemption” at the end of the show. It felt forced and tacked on. I agree that he can reform; that is not what bothered me. It is that the writers brought about his change of heart too fast to be believable and satisfactory. They jammed it into an otherwise moving story, as though they thought no one would like an episode where Hawkeye, the fatherless, anchorless Avenger, helped the most grounded member of the team reconnect with his own father. Maybe they were right, but I doubt it seriously. Of course, perhaps they thought Helmut Zemo could make the leap with ease, since in this series he is in fact a very old man, but he looks and acts young thanks to taking his father’s variant of the Super Soldier Serum. It still feels cheap to me, though, and that is why I make such a fuss about it. The episodes “U-Foes,” “Building the Perfect Weapon,” and “World War Hulk” were great installments. The U-Foes, I think, would make viable fifth-rate villains in season four, but I do not like Widow’s taking offense when Red Hulk labeled everyone on the team “men” at the end of “World War Hulk.” No, she is not a man, but his use of the term is normal and hardly material for an affront, unless he is addressing a room full of women. This he definitely did not do within the show. I would think any female Avenger would ignore this unimportant phrase and deal with the bigger issue – the fact that Red Hulk thought he was the team’s leader. Who died and made him king? Another thing which irritated me in these shows was how Cap acquiesced to Hulk wearing the inhibitor collar. His unabashed appreciation of Red Hulk’s military analysis of situations was equally bothersome. Just because Ross was once a U.S. general with a modicum of talent, it does not make him a great guy. I found it irksome that the writers thought Cap should appreciate Red’s ability to tactically assess a base –especially since he showed that this skill did not stretch nearly far enough. Cap is better than that, people. Stop treating him like a cookie-cutter tin soldier. He is no such thing! One of the things I did enjoy here is that Hulk got to stay on Earth, instead of being tossed off-world and ending up in a gladiatorial arena. Another beautiful touch to the “World War Hulk” episode was the hint of romance between Big Green and Black Widow. Though they have done it before, in this Hulk-centered episode, it had more than its usual impact for viewers. The romance the writers have developed between Natasha and Hulk in Avengers Assemble is something I have come to like quite a bit. It fits the narrative and it gives me hope that, should the writers bring Mockingbird and/or Sharon Carter on the scene, they will be able to handle a Romance Reel with them and their guys as well as they have managed Natasha and the Hulk’s duet. It also lets me hope that when Cap and Tony meet Peggy Carter in season four, the writers will be able to portray that romance with the same adroit touch they have used for Natasha and Hulk. The “Civil War” story arc was truly impressive. For one thing, it was really, really, REALLY nice not to have Tony and Cap trying to kill each other here. The pluses continued to mount when the Mighty Avengers were formed as the antagonistic team, with Princess Sparkle Fists (a.k.a. Captain Marvel) at the head of the group. My only regret is that the writers did not hand her off to the Hulk during the battle. At least he would have actually hit her. Ant-Man and Falcon fighting while flying was a great nod to the film franchise, as was Vision’s accidentally injuring Cap with Mjolnir. It was also highly satisfying to watch Little Miss Stretch pull one of Iron Man’s moves from Age of Ultron, hitting Hulk when he was not expecting it. Rookie though he is, even Inferno would have known better than to do that. But the most surprising moment in the season finale came when Ultron hacked Tony’s suit and arc reactor, thereby taking control of both his mind and body. It was the biggest shock of the event. I did not see that coming, which was the entire point. The Marvel writers truly pulled a rabbit out of their hat when they did it. I only hope the team can purge Ultron from Tony’s system during season four’s “Secret Wars.” Otherwise, I am not going to be a happy camper. To sum up, there are only a few things I have left to say, and they are about the next season of Avengers Assemble. Season three broke new ground for the team by bringing in new players such as Songbird and the Thunderbolts, along with Inferno, Vision, and Black Panther. The additions of villains such as Yalena Belova, Kang the Conqueror, the U-Foes, Egghead, and others expanded Assemble’s villain cadre nicely. Not every season has to revolve around Ultron, Thanos, and Red Skull, after all. And the Avengers do not have to fight Dracula or MODOK every day, either. It is nice to see old enemies with new schemes fighting our heroes. They should get to fight some B, C, and D rated villains like Egghead every now and then. Save a city instead of the planet – piece of cake. Although I do miss watching the team as they tangle with Dr. Doom and Magneto. Doom has disappeared from Assemble and since Marvel is not interested in mixing mutants into its Avengers cartoons anymore, any chance to see how the team would slap down the Master of Magnetism has evaporated. Rats. I would have liked to view that. The upgraded characterizations of our favorite heroes righted the problems I noted in posts about the first and second seasons of the show. They were overdue, but better late than never. These changes have made Assemble much stronger as a series than when it began. I hope that, when it comes time to replace Assemble, I will not have to lecture the writers again on the issues which I pointed out in those prior posts. I will not, however, be holding my breath on that hope. With regard to the original seven Avengers on the team, I would like to ask the Marvel writers to keep up the good work. Leave the stereotypes in the trash, where they belong, and run the characters according to the tried and true formula which you know actually works. Secondly, I would like to ask the writers to please, please drop Jane Foster/“Thorette” from the line-up for season four!! She will be a DISASTER, people! Do not shoot yourselves in the foot here! Three, let Inferno grow and learn from the Avengers. And while I applaud the addition of Black Panther, Songbird, Vision, and soon the Wasp to the series, do not stop there. We want Mockingbird, Spectrum, War Machine, the Winter Soldier, Quicksilver, Scarlet Witch, the Fantastic Four, Daredevil, Iron Fist, Power Man, and many of the other heroes from the comics to at least get a mention in season four. If we are going to have more than the four seasons, then by all means, add them to the cast list. Just because they are not part of the films and live action TV shows, this should not prevent the writers from adding them to the cartoon series. And Scarlet Witch is, in fact, part of the film franchise. So why have she and Quicksilver been left out of Assemble?!?!? It makes no sense to leave the twins out, Marvel writers! Last but most important, I wish to remind the writers that we watch the Avengers because we like good stories with great characters, not because we are looking for a lecture on social justice or the latest cause celeb. If we want any of that junk, we will turn on the news or go to a tabloid stand. Since we are coming to you, it means we want to get away from those things for a little while. Just tell us some good stories, okay? That is all any of us want out of fiction writers. Good stories, well told, with enduring characters. All right? 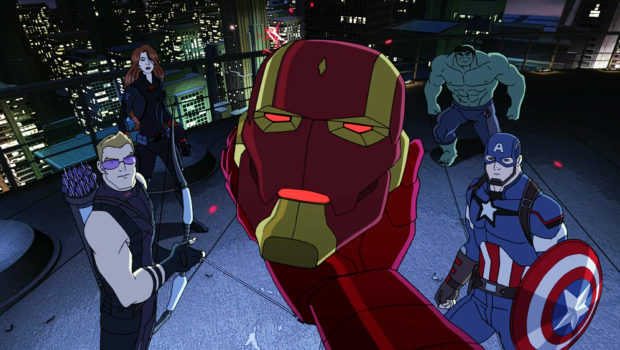 This entry was posted in Marvel Comics' Characters and Stories, TV Shows and tagged Ant-Man/Scott Lang, archers, archery, arrows, Avengers, Avengers Assemble, Avengers: Age of Ultron, Black Bolt, Black Panther/King T'Challa, Black Widow/Natasha Romanoff, Captain America/Steve Rogers, Captain Marvel/Carol Danvers, cartoons, children's animated tv shows, Civil War, Disney TV Shows, Dr. Doom, Dracula, Egghead, Falcon/Sam Wilson, General Thaddeus Thunderbolt Ross, Hawkeye/Clint Barton, hulk, Hulk/Bruce Banner, HYDRA, Inferno/Dante Pertuz, Inhuman Among Us, Inhumans, Iron Man/Tony Stark, Jane Foster/Thor, Kamala Khan, Kang the Conqueror, Layla, Lockjaw, Marvel Comics' Characters and Stories, marvel tv shows, Marvel's 2015 Secret Wars, Mjolnir, Mr. Fantastic, Mr. Fantastic/Reed Richards, Ms. Marvel, Odin, political correctness, Princess Sparkle Fists, Red Hulk, Rocket Raccoon, Secret Wars, SHIELD, Songbird/Melissa Gold, Songbird/Screaming Mimi, superheroes, superpowers, supervillains, The Hulk, The Incredible Hulk, The Inhuman Condition, The Kids Are All Right, Thor, Thor Odinson, Thor/Jane Foster, Thorette, Tony Stark, TV series, TV Shows, ultron, Vision, Yelena Belova on May 12, 2017 by The Mithril Guardian. 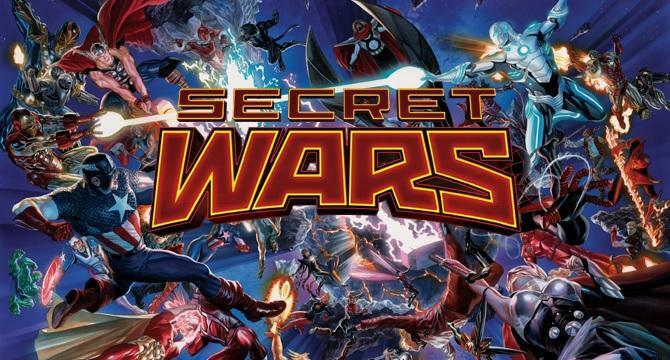 Well, readers, as you know I wrote a post some time ago about Marvel Comics’ latest story arc, “Secret Wars.” That post was called “Stories Matter – Why Marvel Comics’ “Secret Wars” Is Not Marvel-Us.” I recently found out that Marvel plans to merge its “mainstream Marvel Universe – the universe Stan Lee and his friends established – with its Ultimate Marvel Universe. This will result in the “All-New, All-Different” Marvel Comics the company promised some time earlier this year. I am not pleased with this turn of events, as you know, and I just sent two letters to Marvel, listing their storytelling problems and suggesting how they may be repaired. You may read the letters in the rest of this post below. Be advised, in this format they are rather long. I had a fair bit to say. If you would like to provide us with feedback, please contact onlinesupport@marvel.com or go to http://marvel.com/help/contact and fill out the feedback form. Thank you for your time, readers. All I have to say to this is no, No, NO, and NO!!!! Pardon the vehement expression of my feelings, fellow writers, but I think you can hardly blame me. I have enjoyed your “mainstream” Universe since I was first introduced to Marvel. Why would I want to see that universe changed? Why would I want the heroes I have loved in that universe to be destroyed, rewritten, or all around transmogrified? I think I know why you are doing this. Interest in your Ultimate comics has been soaring, while less attention is being given to the stories you have set in the “mainstream” Marvel Universe, have they not? And instead of asking what you may have been doing wrong with regard to the stories in the “mainstream” Marvel Universe, you have decided to mix and match these two series, keeping Stan Lee’s Marvel Universe and adding your own Ultimate Marvel Universe to it in order to boost interest in the “mainstream” Marvel Comics. Honestly, fellow writers, this is nothing more than you applying a band aid to a deep, sucking chest wound in order to stem the flow of blood. You have been destroying the “mainstream” Marvel Universe since this millennium began, and now that it is in an almost unrecognizable shambles, you are now trying to keep it afloat. There is an old fable which might help me make my point, fellow writers. This fable is about a man and his son taking their donkey to market. They pass through a number of towns along the way, and as they go each set of townspeople has their own ideas on how the duo should get to their destination. One set of townspeople chastises the father for making his son walk, so he sets the boy on the donkey’s back. The people in the next town accuse the boy of being a sluggard for letting his father walk while he rides. So the father takes the boy down and rides the donkey himself. The people in the next town say the man should be ashamed of making his son walk while he rides the donkey in ease. The man then puts his son before him on the donkey and they both ride on to the next town. Here the people have a novel idea: both father and son should truss up the donkey and carry it to market, sparing it the long walk. So the father and son do just that. They tie up the donkey’s ankles, tie him to a stick, and begin carrying him on the last leg of their journey. But the donkey is unhappy with being carried like a dead game animal and begins to thrash and kick. The father and son lose hold of the animal on a bridge, which the donkey falls off of. On impact with the river bank, the animal dies, and now the two have no donkey to sell at the market. The point of this fable, fellow writers, is that in trying to please everyone, the father and son satisfied no one, least of all themselves. You have done the exact same thing with the characters Stan Lee and his friends gave you, trying to please the talking heads and other “experts” who say they espouse the ideals of the New Millennium. The fans outside these circles have not been impressed with your stories and have subsequently demonstrated their distaste by ignoring your “mainstream” comics, which have suffered the most under this new regime. But merging the “mainstream” Marvel Universe and the Ultimate Marvel Universe will not save you from the coming crisis of storytelling. If anything, it will be the straw that breaks the camel’s back. Interest may pick up for a time after you make this merger, but eventually, as you pander to the whims of fads and trends, you will cross a line that will make many of your fans lose interest in your 616 comics completely. I cannot guess what that line would be for the multitude of fans, but merging the “mainstream” Marvel Universe with an alternate Universe of any kind would be a good place to start for me. Constant wars and apocalypses occurring semi-monthly in the “mainstream” Marvel Universe. I have mentioned this before, fellow writers. You are destroying too much over and over again. Your apocalyptic storylines and superhero wars are merely rehashed ideas with different heroes or villains thrown into the fight. You have, essentially, put Ragnarok, Doomsday, and the Apocalypse on repeat. And your readers are sick of it. Adding new characters that get a great deal of “screen time” at the expense of the original heroes and villains, or adding new heroes who take on the mantles of original heroes. At least Patriot got to be himself, through and through, bad and good both. Worse, for a girl who seems to be eager to join the Avengers, you instead have Kamala fumbling around and getting picked on by Falcon and the other Avengers. Where the Avengers used to support and encourage new members, you now have them tearing Kamala down for being overeager in a fight. Also, Falcon is still wearing Steve’s suit and using his shield. Do you even have a Falcon in the “mainstream” Marvel Universe anymore, fellow writers? Or has Sam hung up his wings and title for good? If so, that is a real shame, and it means that the first African-American superhero has fallen on very hard times. He can no longer be respected for himself but only because he wears Steve Rogers’ uniform. You have been giving the fans castor oil, in these instances, under the guise of giving them wine. We are not amused, fellow writers. Not in the slightest. Constant killing of the characters with little to no rest in between. You killed Hawkeye once in two cascading storylines, fellow writers. You have dismantled the Vision so many times I have lost count; Wanda Maximoff has been killed at least twice; Jean Grey has been killed seemingly hundreds of times in different storylines; Wolverine has died many times, etcetera ad infinitum. No wonder the heroes go crazy so often, and no wonder your readership for the “mainstream” Marvel Universe has dropped. You cannot, it appears, write a story for it without killing at least one hero in the process of telling the tale. These days, you have also begun killing off entire teams of heroes, not to mention hordes, multitudes, and bucket loads of civilians. Have Marvel’s 616 heroes become so irresponsible that they no longer think to evacuate innocent bystanders? I do not buy that idea at all! Mixing and matching romantic couples. Cyclops and Emma Frost, Wasp and… another guy, Hawkeye’s many different dates – the list is endless, fellow writers, and beyond confusing. Tell me, have you ever read any piece of fiction which had King Arthur married to a woman other than Guinevere? Have you ever heard of Robin Hood loving someone other than Maid Marion? How about Ulysses/Odysseus being married to someone other than Penelope? No? Good. Then we are on the same page. We, the fans, do not want to see Iron Man dally with the Wasp, Carol Danvers, or She-Hulk. What we want is the continuity of the old romantic pairs we once enjoyed: Hank Pym and Janet van Dyne; Steve Rogers and Sharon Carter; Scott Summers and Jean Grey; Ororo Monroe and T’Challa, Clint Barton and Bobbi Morse, and so on. We do not want angst, we do not want guilt trips, and we do not want love affairs that run along willy-nilly with no purpose or reason. We are sick, sick, sick, of it; we miss the old Romantic Reels you had running for so long in the comics and which could be relied on to provide markers for your stories. Without these firm tethers, the “mainstream” Marvel Universe has slipped off its axis and has gone spinning off into oblivion. Turning “left into right, day into night, wrong into right” until not only the heroes but the readers are thoroughly confused. So killing a HYDRA agent who is holding a crowd of civilians hostage is bad, but Ultimate Clint Barton’s murder of Ultimate Natasha Romanoff is all right. “Mainstream” Marvel heroes naturally feel bad when they have to take a life while Ultimate Marvel heroes can kill anyone for any reason without losing sleep. This is foolish and stupid, fellow writers. Cap killed Baron Heinrich Zemo in the original comics – not directly or with intent to get revenge, simply to protect himself and Rick Jones. Understandably, no Marvel hero wants to kill. No one who becomes a soldier truly wants to kill, either. If a soldier or an Avenger does desire that, then something is as wrong with them as it is with Sabertooth. That does not mean that a hero or a soldier may not have to kill someone in the line of duty. But you have all been chasing your tails down the sewers for so long that you have trammeled your imaginations in these areas. Your stories all transform into nails that you must hammer into place, rather than artifacts which you can chisel and carve in unique, inspiring ways. This is another major problem you have with the 616 Marvel Universe. Your “no-win” scenarios are recycled over and over again and – no one wins. Yay…??? Constant rewriting of the heroes’ histories. So now you have rewritten “mainstream” Pietro and Wanda Maximoff’s history so that they are not Magneto’s children, huh? Just like you revised Sam Wilson’s history so that he had been a gangster in his youth and added another brother to the Summers’ family. You did not have to do that with any of these characters, fellow writers. You could have left the twins as Magneto’s children, but made a new character, who somehow came to think that he/she might be related to the Master of Magnetism, only to learn he/she is not. This would be a great tactic to use instead of twisting the Maximoffs’ history for a third time. You could have had Sam mentor someone out of the gang life and into the superhero gig, or given Vulcan a strong, brotherly friendship with Cyclops that eventually ended up like Magneto and Charles Xavier’s friendship. Instead, you rewrote the characters’ histories and threw everyone a curveball, which leaves fans like me scratching their heads and saying, “Why did the writers do this?” It is sooooo stupid! Giving the heroes psychotic “dark sides” they can barely control. I have had my issues with this for a long time, fellow writers, probably since Professor X’s “dark side” took form in the 1990s. Of course Professor X has a dark side! Everyone has a “dark side,” fellow writers. You do, I do, and the dude up the street has a “dark side”! That does not make Marvel’s heroes into villains who wear benevolent masks. That makes them better than the villains, because they have chosen to be better than the Dark. Marvel’s heroes know they have darkness in them. They know they have weaknesses in their characters. They accept that. And then they fight their weaknesses, usually at the same time they are fighting the villains who have become one with the Dark inside and outside of themselves. We fans do not want “heroes” who lose control of themselves at the drop of a hat. We want heroes who keep control of themselves no matter how hard things get, or who redeem themselves when they actually do succumb to their character weaknesses and faults. Look now at the harvest you have reaped: disinterest in the “mainstream” Marvel Universe – the storyline that gave you the multibillion dollar company you are now riding in. You have failed us, the fans, more spectacularly than most other companies would. Do you not realize that you are making your living not with paper and fantasies, fellow writers, but on the hopes and dreams of the fans of the characters you are charged with protecting and strengthening? The sad fact is that you have not done that part of your job very well of late, fellow writers. Or a great number of you have not. You have pandered to the whims of “popular opinion,” put your imaginations out to pasture in the fields of obliteration, and helped to propagate an urge to destroy in a great many people. Every action has an equal and opposite reaction. What do you think the reaction to your misconceived storylines will be? From where I sit, it does not appear that it will be a pretty reaction. If the 616 Marvel Universe evaporates or is merged with an alternate storyline permanently, then many fans will be greatly displeased and upset. Interest in your comics will plummet, and after that – well, there may not be a Marvel Comics company after a few years. I suppose this puts me in the position of being a herald sent ahead to give you warning in time for you to change course of your own accord, before the army arrives and you are laid under a mountain of angry letters in your ivory tower. If that is indeed the case, then as a herald, I have a few suggestions which may help you avoid such a siege before it starts. The customer is not always right, I know. But I do have some ideas which might – might – help you to avoid letting this “donkey” you are leading to market fall off the bridge. Those, however, will be in my next letter. Until that time – Excelsior! In my previous letter, fellow writers, I detailed some of the problems you have made and are making with the stories set in the “mainstream,” or 616, Marvel Universe. In this letter I will list some suggestions which I think may open avenues that may help alleviate this writing crisis you are suffering. Suggestion Number One is that you restore the Marvel Universes to their rightful places. I would say you will profit more from a restored and rejuvenated “mainstream” Marvel Universe rather than a merger of the “mainstream” and Ultimate Marvel Universes. By “restored and rejuvenated” I mean that the Avengers, X-Men, and other Marvel heroes of the 616 realm would be better off if they were returned to their original mission and character parameters. This does not mean returning to the outlooks, costumes, or technology of the 1960s. What I mean by “restoration” is that the heroes should have restored confidence in themselves and in the values for which they fight. As Tony Stark says in “Avengers’ Worlds” in the Avengers Assemble television series, the Avengers are an ideal as much as they are a team. The same goes for the X-Men and the other Marvel heroes. They are not fighting for themselves, for personal glory, or simply to fight. They are fighting to protect innocent civilians from those who would do them great bodily harm. As for the “rejuvenation,” it is helpful to remember that you deal with the fantastic, fellow writers. Time passes for us, writers and fans alike, it is true. But time need not have any noticeable effect on Marvel’s heroes and villains. They are, after all, the archetypes of human nature. Good and bad, human nature has not changed in some time, and it will not be changing in the near future. So, for me, the history of the characters is fine as it is, or at least as it was before the latest rewrites. If people want to complain that Norman Osborn, Doc Ock, and Red Skull should all be pushing up daisies by now, then they have a right to do that. But for myself, I do not care how old any of the heroes or villains are. I only care that they remain the heroes I have always known and loved – or, in the case of the villains, disliked. I think future and current fans will agree with that assessment as well. Marvel fans do not need our heroes to be made younger every ten or twenty years, as DC rejuvenates its characters. We are, actually, quite content to have our old friends keep us company from youth to age. King Arthur, Odysseus/Ulysses, and Robin Hood have walked with untold generations of people from youth to death without aging a day, as it were. I think Cap, Iron Man, Professor X, and the other Marvel heroes deserve that privilege as well. They have earned it many times over. Suggestion Number Two would be that you consider turning away from these constant, universe-ending storylines. You can entertain people just as well with stories where the heroes must save a country, a world, or one family alone, fellow writers. Your predecessors did not have Ragnarok occurring every second Thursday for the simple reason that they did not need to. Neither do you need to do it. It is not because “times were simpler” in the 1960s that Stan Lee and his friends chose to avoid destroying the world/galaxy/universe every weekend. The 1960s, 70s, 80s, and 90s were as tumultuous and fraught with peril as the world is today. Stakes need to be raised with each story in a series, yes. But there is a vast difference between raising the stakes and embracing anarchy, which is what you have given fans these last twenty years or so. If you want some ideas for a good story where the world will not end, fellow writers, then I would suggest you read the newspaper or a history book for inspiration. Or you could talk to veterans of a war – any war. Try talking to the survivors of natural disasters, or other such things. Heavens, you can even ask the children in cancer centers and hospitals what stories they might like to read! Perhaps you could even set up writing competitions where fans can send in story ideas or “scripts” on a certain set of dates or for one weekend. These “windows of opportunity” for the fans need not last long; you could accept the ideas and stories from fans over the course of a day or two, and then close the event until the same date next month/next year. Doing this would give you the time you need to process the ideas sent in and to ask fans for clarification of their suggestions/stories – or even to ask them if they would like a job at Marvel. Fellow writers, the truth of the matter is that if you want to know what we desire, then, you simply need to ask us. Not a handful of us, picked from a certain area to make a focus group of twenty to a hundred, but all of us in a controlled environment, such as the writing competition I mentioned above. In this way we would each get our say – or our letter, as the case may be – and you would have a better idea of what kind of stories we would like to see. It would also help you to avert storyline disasters like this imminent merger of the “mainstream” and Ultimate Marvel Universes. This brings me to Suggestion Number Three which regards the addition of “modern” characters to the roster of our old favorites – not to mention giving them the codenames of original Marvel characters – in the “mainstream” Marvel Universe. I would also like to say that, if you truly wish to have a black Captain America, then please do it in an alternate Universe, not in the “mainstream” Marvel Universe. Yes, I know what you have been “secretly” trying to do with Sam Wilson. It is the same thing Henry Peter Gyrich did when he reduced the Avengers’ roster to seven and made them add Falcon to the team. The Avengers would gladly have accepted Falcon on his own merits, but Gyrich wanted them to be politically correct or some other such biased nonsense. So he forced Falcon to join the team. Sam was understandably angry about that, and he was right to be angry. Because then, as now, forcing someone to do, say, or choose something in order to win political points is wrong. Then as now forcing Sam to be where he does not want to be damages him, it does not help him. Sam Wilson, in the “mainstream” Marvel Universe, has the honor of being the very first African-American superhero in comic-dom. He deserves to retain that distinction in the 616 Universe, not to be shoehorned into the 616 Captain America uniform and role. What you have done to him is you have stolen his position and pride from him, as much as Gyrich did in the 1970s. This is not only highly unfair and derogatory to the Falcon, fellow writers, but it is also demeaning to his fans (me among them) as well. He and his fans deserve better treatment from you and a great deal more respect than you have shown to him and to us. Besides which, mixing and matching heroes and their costumes is proven folly. No one liked having Clint Barton or Bucky Barnes in the Captain America uniform. And neither character truly wanted it. They – and we – prefer to have our “mainstream” favorites retain their original identities, characteristics, and suits. We prefer that 616 Steve Rogers remain Captain America and 616 Sam Wilson remain the Falcon. Do what you like with them in alternate Universes (you have already proven that you like to “play” with the heroes there) but leave the 616 Captain America and the 616 Falcon as they are! In fact, please consider leaving all the original 616 characters as they are. This also goes for new characters like Kamala Khan as well. And I would note that she would do better as a character if she did not have to live up to Carol Danvers’ old codename. She is, from what I have heard, a widely liked character, and she therefore merits the ability to stand on her own two feet – not on Carol Danvers’ shoulders. Any other new characters you wish to add to the “mainstream” Marvel Universe should also be able to walk the walk and talk the talk as themselves, not as “replacements” for heroes who have “moved on” to other codenames. As you might have noticed, “replacing” original characters with new ones is more likely to anger fans than to entertain them. Also with regard to Kamala, new young heroes would do better if they had more experienced heroes standing with them, encouraging them, and watching their back. I am not advocating that new Marvel heroes become sidekicks to current Marvel heroes. That is DC Comics’ shtick, and they can have it. But as you know, previous Marvel writers had Storm and Wolverine mentor Kitty Pryde during her early years with the X-Men. Both characters grew and learned as they taught, molded, and guided the twelve year old into her role as an X-Man. It is very sad to me that other new heroes, like Kamala Khan and Kate Bishop, have been denied that chance. This should not be the case, fellow writers, and it would be better if you could rectify this situation. As to adding new teenage or twenty-odd year old heroes to the X-Men, the Avengers, and Heroes for Hire, et al, you might try adding one or two characters at a time to the team roster. This is how Hawkeye, Quicksilver, and the Scarlet Witch were introduced to the Avengers, and it is easier for readers to keep track of one or two new characters – three at the most – rather than chasing around after five or six “newbies” throughout a single story. If it worked for your predecessors, then I see nothing preventing you from following through on this idea. Choose established fact over deluded fiction – what a concept! Suggestion Number Four covers two issues I have: romantic relationships in the Marvel Universe, and the friendship between superheroes and superhero teams. First and foremost, can you puh-lease stop the romantic rampage around the May Pole some of our heroes have been going through these last twenty years? I can handle Tony having a different girlfriend every other year, or Natasha finding a new boyfriend a year or two after she and her last man decided they could not get along. I can even handle Bruce Banner and Natasha Romanoff dating, for crying out loud! But as I said in my previous letter, King Arthur always has Guinevere, Robin Hood always has Maid Marion, and Ulysses/Odysseus always has Penelope. So why can Cyclops not keep Jean Gray; Steve Rogers keep Sharon Carter; Hank Pym keep Janet van Dyne; Clint Barton keep Bobbi Morse, etc., keep their romances together? It does not make life interesting – for our heroes or for us, fellow writers – if we are always trying to keep straight which boys and girls go together. We fans like stability, and for writers who pride themselves on keeping Marvel’s continuity flowing smoothly from now until Doomsday, you have not held to this coda in the romantic aspect of the 616 Universe at all. I am curious as to why you have written the 616 X-Men and 616 Avengers as enemies. The “mainstream” Avengers are on good terms with the Fantastic Four, Heroes for Hire, and SHIELD. For all I know, they may also be friends with superhero teams Alpha Flight, Big Hero 6, and the Winter Guard. On the other hand, you have had the 616 X-Men retreating from contact with outside teams and people. I see no reason for either this xenophobic exclusion or for any enmity between the ”mainstream” X-Men and Avengers, especially since 616 X-Men Beast, Wolverine, Quicksilver, and Storm have done time wearing an A instead of an X.
I suggest that these two 616 teams should learn to coexist and even rely on each other in times of danger in the future. If the “mainstream” X-Men have a problem and need help, for example, then they could easily contact the 616 Avengers and ask that they lend a hand. What are the Avengers going to do, say no? They have sworn to help everybody who needs or asks for their assistance. There is no reason I can see why the “mainstream” Avengers would deny aid to the 616 X-Men when they needed help. Members of both teams are good friends with each other in the “mainstream” Universe, despite working for different superhero units/armies. Therefore, it makes sense that the teams would follow the patterns of their members and learn to get along. Instead of tearing them apart fellow writers, or forcing them to merge (I know about the Unity Squad) you can – and I think you should – allow the “mainstream” X-Men and Avengers to be friends and allies. They are the biggest superhero teams on the planet. It only makes sense that they should learn to coexist with each other. The battles/wars between the teams have led only to the pain and destruction the Avenger and the X-Men have promised to prevent, and it is out of character for them to choose to fight like this, I think. For Suggestion Number Five, I recommend that you stop having the heroes feel guilty about justly killing an enemy who would not otherwise be stopped. While making this concession to necessity (and reality), the heroes could steadfastly maintain a policy of not committing murder. Should this policy be violated in a major way, they can quite rightly put any hero who breaks that code on parole at the least, behind bars at the most. (Deadpool would certainly qualify as a ‘poster boy’ for the latter category.) Other areas where right and wrong have been “confused” and “made gray” should also be straightened out, fellow writers, if it is at all possible. Your fans will definitely thank you for it! Suggestion Number Six: As I have said in previous letters, fellow writers, if you feel that you must change the histories of the original characters Stan Lee and his friends introduced to us, then please be kind enough to do so in an alternate Marvel Universe! The “mainstream” Marvel Universe is your primary bread and butter for the simple reason that it is the one fans – old and new – rely on to understand your alternate universes. If a particular alternate Marvel Universe tickles a fan’s fancy, then he can enjoy that one in addition to or in preference over the original Marvel Universe. Most of your fans, however, have some kind of respect for the “mainstream” Marvel Universe and use it as a touchstone to navigate your other comic book worlds. Take away the platform of the 616 Marvel Universe, and all your alternate universes crumble to dust. I think you are well aware of that, fellow writers, but your current plans mean that this fact bears repeating – again. Suggestion Number Seven is this: I mentioned at the beginning of this letter. Should you choose to restore and rejuvenate the “mainstream” Marvel Universe rather than merge it with the Ultimate Marvel Universe, fellow writers, I think you would profit greatly if you choose to restore the heroes’ confidence not only in themselves but in the ideals they fight for. An ideal is not a fiction, fantasy, or anything so intangible. Nor is it an ideology that people will die for. The uniting ideal of the Marvel Heroes is the protection of innocent civilians from aggressors who would otherwise do them mortal harm. For that reason Marvel’s heroes take a great deal of punishment without looking for a reward of any kind for their service. They deserve to fight for that ideal again, with clear consciences and a right understanding of who and what they are. Fighting to protect others is certainly not going to be easy, and it will not always be fun. The heroes will make mistakes, they will have accidents, and they will get hurt. But they will know what they are fighting for. They will recognize that they have darkness in them, weaknesses and faults that they will occasionally have to face head on. But they will know that they can control the darkness within them, that they can choose to reject it. That they can fight it as they battle their physical adversaries. Once again, they will know that they are heroes. That they can, if they fall and fail, redeem themselves with enough effort and determination. And we, the fans, as well as you, fellow writers, will know and benefit from their insight as well. These are my suggestions with regard to the direction in which I think you would be better served taking the “mainstream” Marvel Comics. Since these letters will be published on my blog – thoughtsontheedgeofforever.wordpress.com – once I have sent them to you, along with the email addresses of your separate writing departments, others may have better suggestions which augment and/or improve on my own. As a last note, fellow writers, please take the time to reconsider your current story trajectory. If you take that road, you will fail and fall. A better road might be the one I have taken pains to suggest. Your current plan will end in your comic book empire’s story-telling collapse if you do not turn away from it. That is not something I want, fellow writers. If I did, or if I was indifferent to the “mainstream” Marvel Universe’s survival – not to mention the survival of Marvel as a company – then I would not have written this letter to you, nor used my precious time and breath to give you my opinion. Do me at least this one favor, fellow writers: please make these letters worth my time and energy, for your own sakes as well as mine. This entry was posted in Marvel Comics' Characters and Stories and tagged "mainstream" Marvel Universe, All-New All-Different Marvel Comics, e-mail adresses, General Feedback, letters to the editors, Marvel, Marvel Comics' Characters and Stories, Marvel fans, Marvel's 2015 Secret Wars, Marvel's hierarchy, marvel.com, Secret Wars on October 6, 2015 by The Mithril Guardian.